For the would-be transcriptionists that don't have the money to spare to buy foot pedals, (Even the relatively affordable ones like mine) Money (or the lack thereof) should not be a hindrance. This data is available in the Web for those who know how to look, i'm just spreading the word out so that it'd be able to reach more. 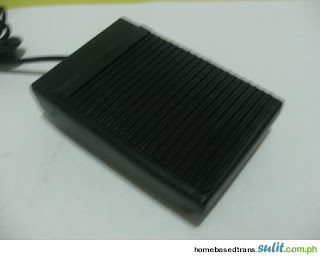 Here's how you can build your very own foot pedal. And before running off to Radioshack to start on building one, I'd remind everyone that the instructions mentioned below have only been tested for use witn ExpressScribe, Startstop, and Inqscribe. Soldering gun and a little soldering know how. As for the wiring, i got these from ExpressScribe's website. Pins 1, 3 and 6 must be connected to each other. A pedal switch between 2 and 4 is Reverse. A pedal switch between pins 5 and 7 is play. A pedal switch between pins 5 and 7 is fast-forward. A pedal switch between pins 10 and 5 is play. Forward - Pin 9 (RING) or Pin 8 (CTS). If you have any questions, feel free to ask me and I'll try to answer it as best I can. And before building one, please opt for my footpedals first, they'r reasonably priced, made of durable steel, and have six-month warranties. List down your cost of building one and pit them against buying one of mine's and you'll see that I'm giving you a pretty sweet deal. Medical Transcription Training Offers Information on Medical Transcription Companies - Training Institutes , Course Material , Free Tutorials , Sample Voice Files & Dictated Documents , Ftp servers , Toll Free Number , Transcription Equipments Like Foot Pedals , Amplifiers , Headsets. A video would be a better guide.